The problems are real, and totally understandable. The truth is that the way you've been taught to get referrals is fundamentally flawed. It's a totally selfish process--all about getting more business for you. Nothing wrong with getting new business, that's the end goal, but the old referral approach is a one-sided proposition. And questionable value for the prospect being referred. At the end of the day, the only way we measure the success of a referral is if you sell something to the referred prospect. And in the old model of referrals, you have to go ask your client if they know anybody that needs what you do. Then, they’ve got to think…and think…and think…to try and come up with a suitable prospect for you. IF they do (and that’s a big if), then they have to go and sell their friend, colleague, family member, maybe even valued client, on meeting you. And what do we call this meeting? I don’t know about you, but I don’t know anyone who wants to go to a sales meeting. So your client, who wants to help you is in a tough spot. You’re asking this person to do your prospecting for you, convince the potential client to agree to a sales meeting with you, and make the connection. Most highly-paid and highly-trained sales people struggle to do this, and you expect your unpaid and untrained sales force (your clients) to be able to do this successfully…? It’s not your fault, it’s a bad model. We got rave reviews for those workshops, and people left thinking they would soon be creating a lot more referrals. Six months later I went and followed-up with about 20 of the people who attended, just to check on their progress. I was sure I’d hear amazing stories of success. For these highly successful business people, asking for referrals was hard. It made them uncomfortable. They felt they were taking value from their relationships with their clients (who were already paying them big bucks). After really digging deep, I realized that this wasn’t some trivial concern, it was a fundamental flaw in the referral process. The “old way” of asking for referrals is a one-way flow of value. The root of the problem with referrals is that it’s all about you. Specifically, about you getting more clients. There’s little to gain from a client referring you, and a lot of risk (if you mess up…their reputation is damaged). And, I show you a simple and clear process to quickly unlock all the referrals that are, right now, sitting there, hidden in your network. Those referrals are just waiting for you to go get them, but you need an easier way, a low-risk way. In the course, I’ll show you step-by-step exactly how to do that. That’s right, your clients do want to help you, but they’ve got their own lives, their own businesses, and they’re busy just like you, trying to get everything done. They may be willing to help you, but at the end of a long day, few will do anything to help you…it’s just too much work. The answer is to make it painfully easy for them to refer. Together, they’ll make it easy for you to start getting 5, 10, even 20 referrals at a time, from a single client. "More Leads Than I Can Handle"
"I’ve been following your system for four years, and it produces new referrals, month-in and month-out. I’ve now got more leads than I can handle. It’s a good problem to have." "Stop Thinking If You Should Dive Into Steve's Unstoppable Referrals World, Just Do It..."
"Steve's approach is now the cornerstone of my strategy, and I can tell you that it works so well. Attracting the right clients to your business is a key objective to any entrepreneur and Steve's referral approach will do that every day. To every business owner I would say - stop thinking if you should dive into Steve's Unstoppable Referrals world, just do it! It will be a game changer for you too!" 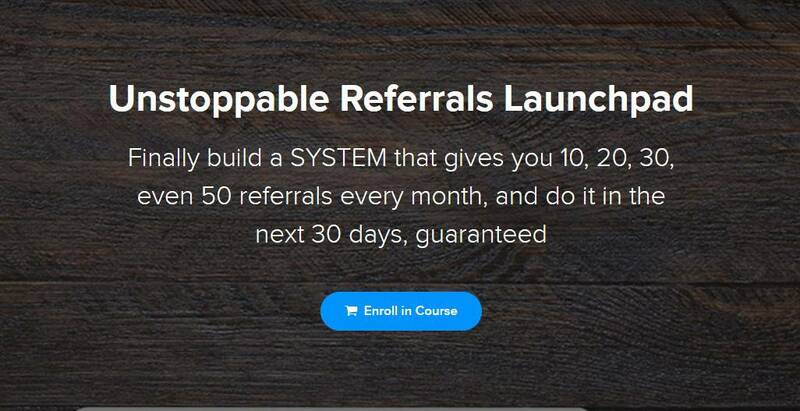 "Once you've followed the steps, you have a repeatable, scalable SYSTEM for generating referrals on a consistent basis." "Most 'formulas' for increasing referrals boil down to 'Just ask, and keep asking,' or 'Be a nice person, and use this magic script.' Which is why most business owners don't ask for referrals, or do so in an uncomfortably ham-handed fashion. What I like about Steve's approach, as he's cut through the clutter to help business owners get CLARITY on who they really want to be referred, with a simple, elegant system for doing so. 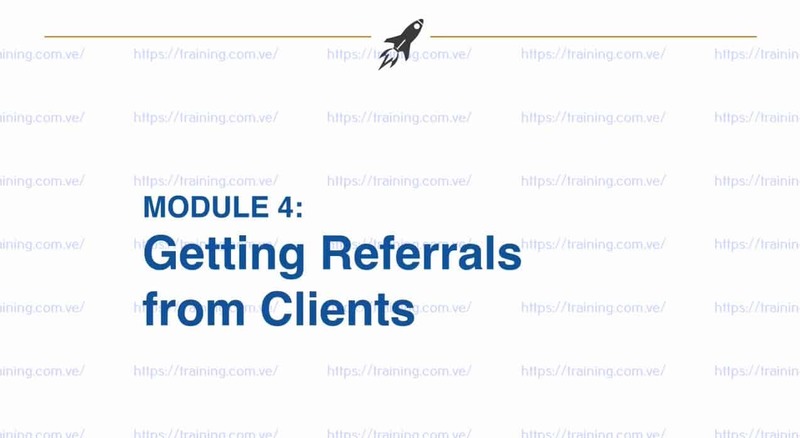 And once you've followed the steps, you have a repeatable, scalable SYSTEM for generating referrals on a consistent basis." What if I'm unhappy with the course, or if I try it and it doesn't work for me? We would never want you to be unhappy! If you are unsatisfied with your purchase or just decide it's not for you, contact us in the first 30 days and we will give you a full refund. 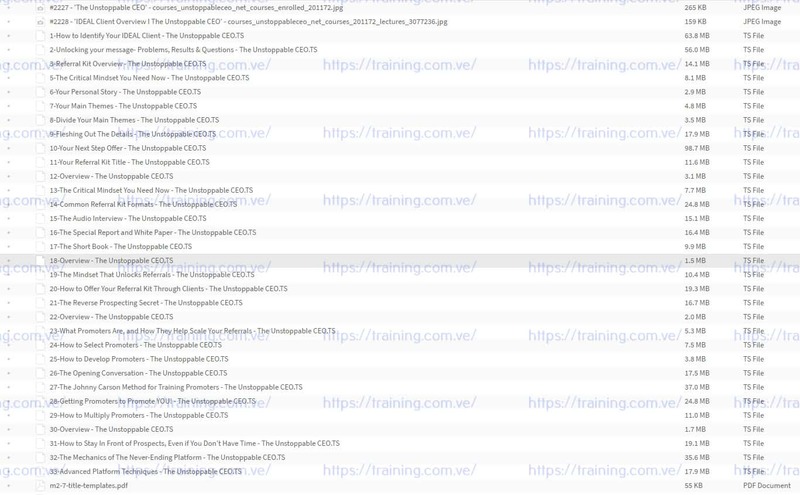 Beyond that, if you try to apply the strategies in the course and still aren't getting results, just email me ([email protected]) and let me know what you've done. We'll refund your purchase price and I'll work with you to get you to get the referral process producing for you. My clients are private. Discretion and confidentiality are essential to my business, will this still work for me? It will. We have worked with therapists, attorneys, and others whose clients are very private. In some cases, they would never want to reveal that they are working with you because of the sensitive nature of your work. In those cases you'll turn to your network of referral partners. In the course we show you how to do that (and how to build a network if you don't have one). What if I get stuck? Can I get help? Yes. When you enroll, you'll be sent instructions for joining a private discussion group for the course. My team and I will be in there answering your questions. Yes, you can. The course is accessible (and easy to use) on Apple and Android devices (phones and tablets). Just send us an email ([email protected]) and we'll answer any question you have. When would be a better time to start, than now? If you've been looking for a clear and simple strategy for getting more clients, and you're tired of trying to get "Internet leads", tired of making cold calls, and just want something that works now, and will work for years to come, the Unstoppable Referrals™ approach is it. I encourage you to jump-in. There's no risk. You could be landing new clients in the next 30-days.